VTU 8th Semester Results 2016 for B.E/B.Tech: The Visweswaraya Technological University has declared the Eighth semester B.E/B.Tech Results of 2016. The university had already announced the results of MBA 1st, 3rd, and 4th-semester results. 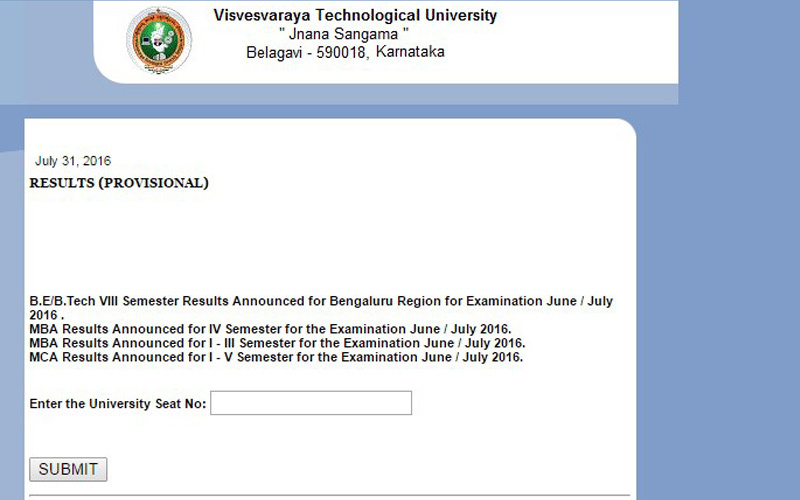 Check your results at the Official website of VTU, Belagavi-590018, Karnataka. Scroll down and get the direct result page link. The 8th-semester exam results for Visweswaraya Technological University has announced today on 31 July 2016 at nearly 09:00 PM. The university examination has conducted on the period of June-July 2016. The Students are eagerly waiting for their results, and it is finally declared. Get the direct link here below. Kindly Visit the VTU official website OR Click the above direct link. The Page displayed as like the Image given above. Enter the University Seat No. in the given field. Now, click ‘submit ‘ button. The Result Page will display. Print/Save/Download for your further use.